The RollerTop™ is a new invention developed by road warriors for road warriors. All patents are pending. This invention allows business travelers, field professionals and students who carry their portable computers and a roller briefcase be more efficient, comfortable and safer. The improvements in comfort and ergonomics that are achieved by using this product versus using the portable computer on the lap are significant. Height, as well as typing and screen viewing angles can be easily adjusted on the fly. Using the RollerTop™ you can relief yourself from the heat, weight and risks associated with using the laptop on your lap. Also, you will enjoy the convenience of having a portable workplace that keeps your portable computer and related documents and accessories together, well organized. We see it as “the natural evolution of portable computing”. Laptop computers are rather uncomfortable to use during travel. 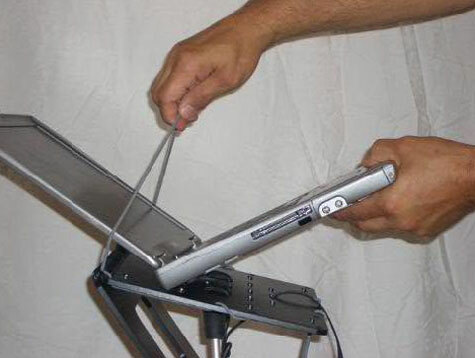 If a business traveler needs to stand in line for a period of time and wants to work on his notebook computer he needs to hold the computer with one arm and type (and use the pointing device) single handed with his other hand. This approach results in a very uncomfortable working position that no one can sustain for a relative long period of time. Also, this position makes the display available for other people standing behind in line to see the information in the screen. It is so bad that typically a person would rather not use his laptop at all while standing up in line. If not standing in line but just waiting in a seating area, the person who wants to work on his laptop often tries to find a seat first. If the seat is available, he sits down and uses his computer on his lap. While this is better than standing up holding the computer and typing single-handed, it can still become rather uncomfortable and risky as the computer on the person’s lap may get hot and heavy over time. Working for long periods of time sitting down with a laptop computer on your lap can also bring neck and back pains as users typically arc their backs and necks to be able to read the screen and type. Although uncomfortable and risky, it is still very common to see people today at the airport and other waiting areas using their portable computers either standing up, sitting on the floor or on a chair with the computer in their lap, in a very uncomfortable position. The RollerTop™ is a very versatile solution to the problems above. Travelers can easily turn their roller bags into a rigid and stable tabletop in a matter of seconds. 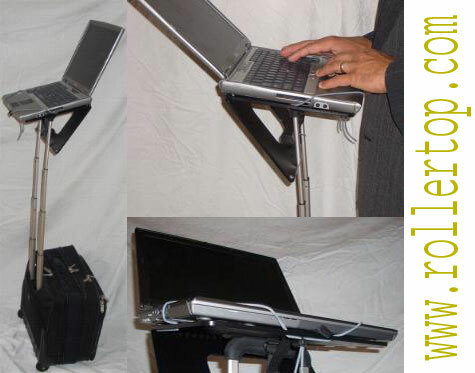 This tabletop is designed to fit a computer notebook, significantly improving the ergonomics of working on the portable computer while traveling. As roller bag handles are height adjustable, the RollerTop™ height can be easily adjusted for working standing up or sitting down. Even when installed, a user standing in line can walk and push his roller bag with him, not limiting his movement forward as the line advances and staying completely mobile while working on his computer. Pleasure travelers can also benefit from the RollerTop™ as it can also be used as a coffee table, playing table or simply to setup a notebook or video DVD player. The RollerTop™ is designed by “road warriors” for road warriors. “Having traveled internationally for more than 15 years as an IT professional carrying a laptop, I experienced the benefit of this invention first hand’. The RollerTop™ is made with top quality fabrics and plastics. The main panels are made out of marine-grade plastic and it is practically indestructible. The simplicity of the design and the quality of the materials is evident. When installed, it assumes a triangular shape that provides stability and firmness. As it sits on top of the handle, it is balanced at the center of gravity of the roller bag, making it steady. If needed, the user can easily customize the RollerTop by moving the holding strap mechanism one slot forward or backwards, to achieve the appropriate balance. 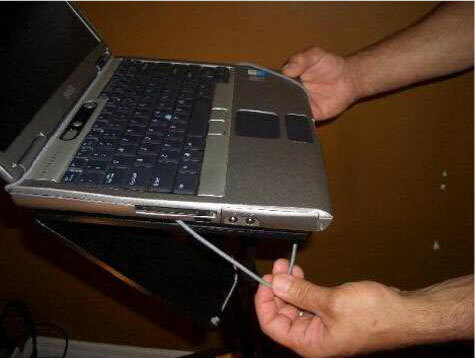 A harness “hook” is also provided to secure the computer even further when used in a stand up configuration, if needed.